Bookbinders are forced to make their own tools every now and then. Here are some ideas for specialized sanding blocks. When preparing the edges of a text block for edge decoration, wrap sandpaper around an eraser (my favorite) or a small rectangular piece of wood. Presto! An instant mini-sanding block. If the fore-edge of the text block is curved (rounded spine), then you can sand it smooth with sandpaper wrapped around a wooden dowel that fits into the curvature of the fore-edge. 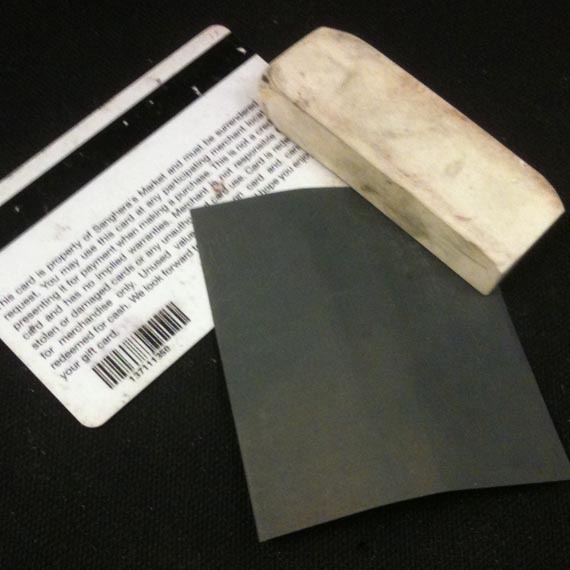 To clean out the joints between the cover boards and the spine, wrap the sandpaper around the edge of an old credit card.